After 35 days of a federal government shutdown that left many people hungry and at risk of foreclosure and eviction, and threatened the safety of our food and our transportation systems, it was the power of workers joining together that finally led President Trump to abandon his attempt to use federal workers as political pawns. Just days before the end of the shutdown, AFA-CWA International President Sara Nelson, along with National Air Traffic Controllers Association (NATCA) President Paul Rinaldi and Air Line Pilots Association (ALPA) President Joe DePete, issued a statement highlighting the grave safety issues that their members were facing during the shutdown and calling for Congress and the White House to take action. Last Friday, serious safety concerns and a lack of staffing of air traffic controllers caused a slowdown at the busiest airports in the U.S. The disruption in air travel led Trump to back down and make a deal with congressional leadership to end the shutdown. Air traffic controllers were among hundreds of thousands of workers affected by missing two paychecks due to the shutdown. "If there is anything this shutdown has taught us, it should be that labor rights matter," said Nelson. "We must work together to improve rights for working Americans. Our democracy depends on it." 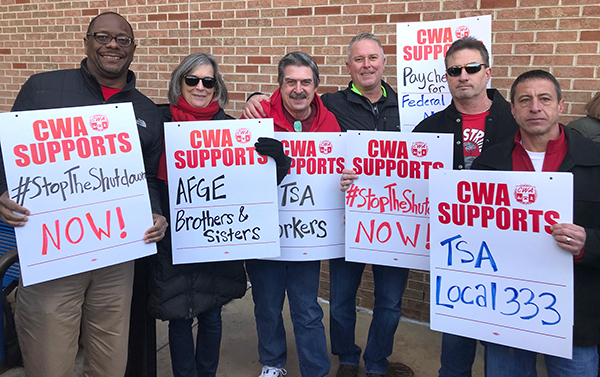 Throughout the shutdown, CWA members across the country made calls and took part in solidarity actions.